As reference to Sirius and Canopus crossing through passages has been made, it is worth offering some images concerning the journeys of these stars, and the overall appearance that those journeys sequence as during the extreme dates concerning Sirius and its heights. The shapes of the equatorial and ecliptic lines also have to be compared, and while I admit that it is only speculation, the form of the entrance glyph has to be compared in this section. The apparent shapes that the journeys of the stars make are the objective initially, and they can be compared to those of the Sun, but firstly the following images are compilations of the sequenced positions of Sirius and Canopus as they travel across the sky in the years 11,875 BCE, and then 627 CE. They each have the static backgrounds of the TI being observed. 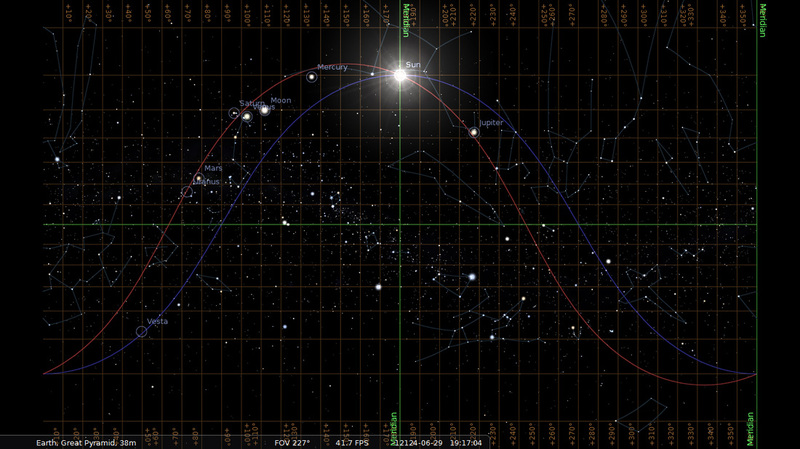 What can be seen are sequence positions for Sirius indicating half-hourly locations for one day in the greater ellipse, and Canopus in hourly locations in the smaller ellipse, circling the southern circumpolar point. They are a simple enough appearance in their duality, and quite different to how they appear in the next image. Both of the above are certainly interesting in their portrayals of the stars in their sequenced positions. When compared to those of the Sun, we are being shown representations of 'mounds' once again when sequences are given, and the following image shows the positions of the Sun over several hours, with the static background of dawn, on the winter solstice of 11,875 BCE. Of course it is the arc of the Sun during the solstice that is important. On March 26, 11,875 BCE, the Sun rises at 117.33806º; at midday, it will be exactly upon the southern meridian and the TI will be offset from being exactly upon the horizon by some 2.1" above in the west and below in the east. Approximately 13 1/2 seconds later, the TI will be observed and when it is, the Sun will be 3.86667' west of the southern meridian, or 3' 52" notational. At its highest point at midday, the Sun crosses the meridian at 36.5794º latitude, and then at sunset, it crosses the horizon at 242.66194º. 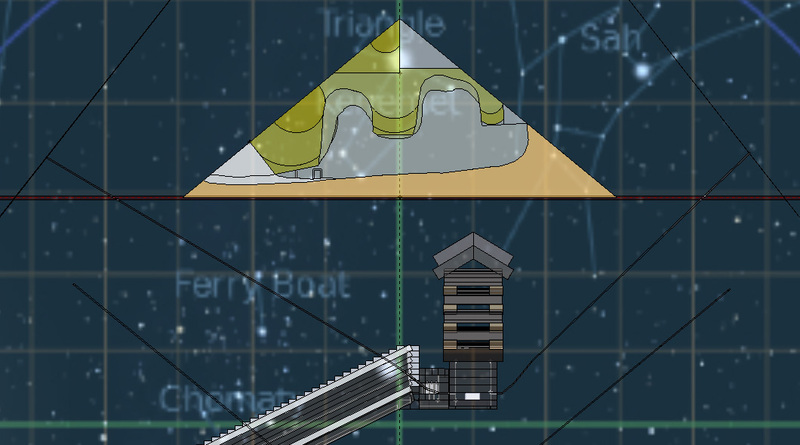 As a course through the sky, the image shows this journey, and the highest point it reaches upon the pyramid is 2,413" above the pavement, or the 77th course. Seeing the Sun depicted in such an image offers up a speculation towards the illusion of a mound. It is a low mound, showing the actual locations of the Sun as seventeen hourly increments, beginning with the third hour before dawn and ending with the third hour after sunset. While this is placed upon the static background of dawn itself, and the ecliptic line can only really reference how it appears at dawn, the equatorial line does of course show its form as viewed from the location of the pyramid. To see the Sun in the hours not represented would have it firstly arcing in from the left of the scene, out of the low north, and then arcing out to the right, to the low north, but they are not necessary for this offering. 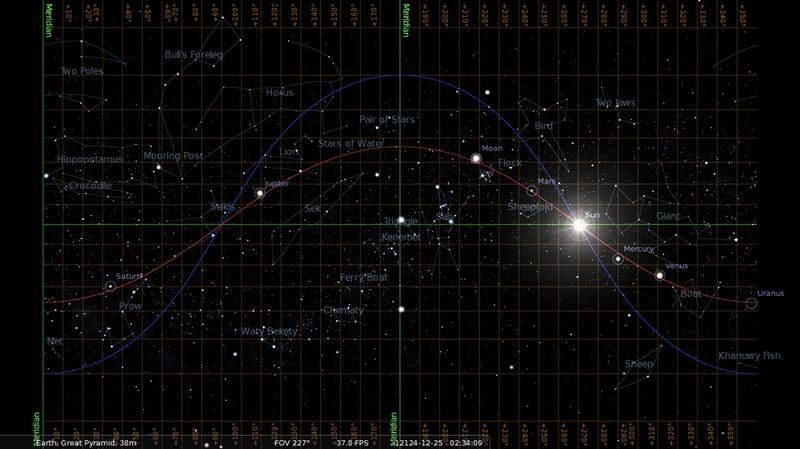 In this image, showing half hour increments of the movement of the Sun, having the static background of the stars as they appear at dawn on September 25, 11,875 BCE, we see the illusion of a greater mound as compared to that of the winter solstice sequence. Showing the sequenced portrayals of Sirius and Canopus, and those of the Sun on the solstices, does offer one answer to the question concerning the entrance glyph and a possible direction towards an answer. Another possibility to do with 'mounds' comes in the forms of the ecliptic and equatorial lines. The ecliptic line is shown in its distortion of how the planets are spread upon its plane, and how the star-field is spread in relation to the time of day, while always the equatorial line holds its exact form. No matter what images are represented, the equatorial line always holds its form, and it can be speculated that this line must be very important when it comes to having a reference to the pyramid. In every image which shows the TI being observed, the form of the ecliptic is always the same, no matter where the Sun is located. In every image presented where the Sun is either exactly at dawn on an equinox, or very close to this, we have always seen the ecliptic having the same shape. In the glyph above the entrance, the purpose of the two mounds is very questionable as to what is being represented, and by a continuous static observation that the equatorial line stays constant and unchanged no matter how many different dates are seen, the possibility that it is depicted in the glyph could be accepted. While there are movements of all other forms in different ways and expressions, the equatorial line stays constant; to accept this as being one of the mounds, then the other mound could be anything, from that of the portrayals of Sirius or Canopus in singular sequenced snap-shots of the moments at their lowest or highest positions; or the Sun at any of the equinoxes or solstices which only have a slight variation to their positions over long periods of time, but their smooth arcs astronomically portrayed can allude to a mound. One other possibility is the other mound does represent the ecliptic line, but at such a moment that there has to be an interaction with the equatorial line that is quite important; considering the glyph does seem very much like the Sphinx, and even the constellation Leo itself, then the combination of ecliptic, equatorial line and Leo must be of a representation as to appear significant in how they are seen, especially at some point in time between 12,275 and 11,862 BCE, considering this period is the beginning period for the pyramid's plan. Very early in the analysis, it was shown that the configuration of the stars at 12,118 BCE had the Sun at a little before dawn while Sirius occupied a particular position. The purpose of this image was to show the Sun within the entrance passage; to have the Sun at dawn upon an equinox date while Sirius still occupies an important position, and to have the ecliptic and equatorial lines as being inclusive with the form of Leo, the date of June 29th 12,124 BCE, an equinox, exactly at dawn, is seen in the next image. There are several important observations here, beginning with the location of Sirius which would have it exactly upon the centre of the niche in the Queen Chamber, exactly upon the floor level; Canopus has its centre an inch outside the Subterranean Chamber and a few inches above the roof of the passage there; Regulus is just off the ecliptic which is always its position; and Zosma is exactly upon the equatorial line, which happens only twice per precessional period. The Sun is upon the triple intersection of horizon, ecliptic and equatorial lines because this portrays an equinox, and this makes the arcs of the ecliptic and equatorial lines appear smooth and well spaced. It is easy to see the importance of the position of Leo and its two stars bridging the two lines, as if it were connecting two separate 'realms' of existence depicted by the two lines, one solid and unmoving while the other wanders according to the time of year and time of day. 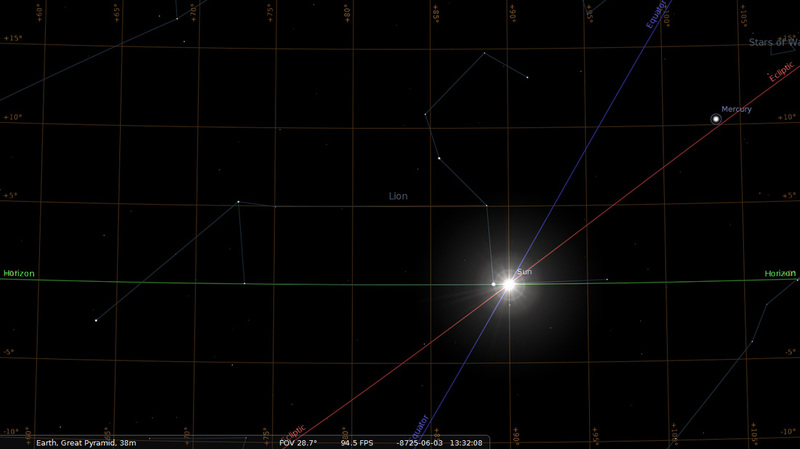 While this depicts one equinox with the Sun at dawn, there is another view which shows the same star configuration upon the equinox but this time at sunset. The following image shows this, on the date of December 25th, 12,124 BCE. Having two such views of the equinoxes with one at dawn and the other at sunset is better appreciated when their midday views are also included. The next two images shows these views, and the importance of them is seen by the arcs and intersections of the ecliptic and equatorial lines which depict the Sun uniting both lines upon the meridian. To fully appreciate the significance of these kinds of images, it is worth having an image of the entrance glyph again, showing the two mounds where one is slightly larger than the other. 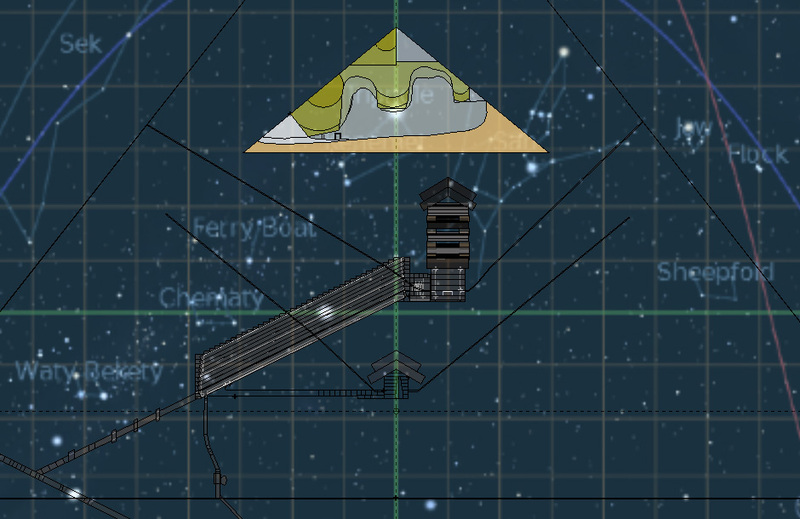 There has never been a constructive definition for what this feature depicts, and it is my contention that it depicts several integrated expressions merged from astronomical observations and extended to the Giza Plateau. From the dawn and sunset images, Leo is seen to be slightly angled downwards from being exactly horizontal, being mimicked and mirrored in the glyph; the two mounds depict the ecliptic and equatorial lines, while also depicting the apparent arcs of Sirius on the right and Canopus on the left; and the form of the pyramid itself in the feature represents the final effort of how this portrayal will be represented, while also defining a third substantial structure besides the two mounds. In other words, the right-hand mound ultimately represents the Great Pyramid itself, Khufu's Pyramid, in the form of the Temple of Isis which has its name altered from the star of Sirius which is Isis' original representation; the left-hand mound represents the second pyramid, Khafre's Pyramid, whose internal architecture has its central chamber in a position that borders the actual ground level while also being raised above this level, which can be referenced from the position that Canopus attains at its highest location around 627 CE; and the pyramid form itself in the glyph represents the third pyramid, Menkaure's Pyramid, the only form in the glyph that actually depicts a pyramid. But the Temple of Isis is also entitled Queen of the Western Mountain, which would offer up a comparable Eastern Mountain with a particular personage as its head, and we are aware that the glyph for Akhet shows the two mountains with the Sun's disc between them; and also the two mountains are deigned 'yesterday' and 'tomorrow', so the Sun itself in its position would be considered the here-and-now. Or, this glyph represents all of these possibilities rolled up into the Great Pyramid itself, which is composed and constructed based upon several layers of meaning that can be identified when a particular key is used to unlock any of the meanings at any one moment. The three forms together could identify the three pyramids, and also the stars Sirius and Canopus, and the constellation of Leo, and the forms of the ecliptic and equatorial lines, and the arcs of the Sun on particular days each year. It is a multi-layered form that includes discs and two horizons and three vertical levels and three horizontal zones; and while still speculating, there is a further step that can be made. We are aware of Ruti, the two lions back to back in their effort to convey a meaning towards the Akhet, but there is also another name which has been used towards the Sphinx at some time in the distant past, as well as being a name indicating one aspect of Horus: Re-Horakety; or Horus of the Two Horizons. To mention this is in connection with another way of imagining the astronomical layout of the sky, and how it can be viewed in two separate configurations according to how 'horizon' can be offered. 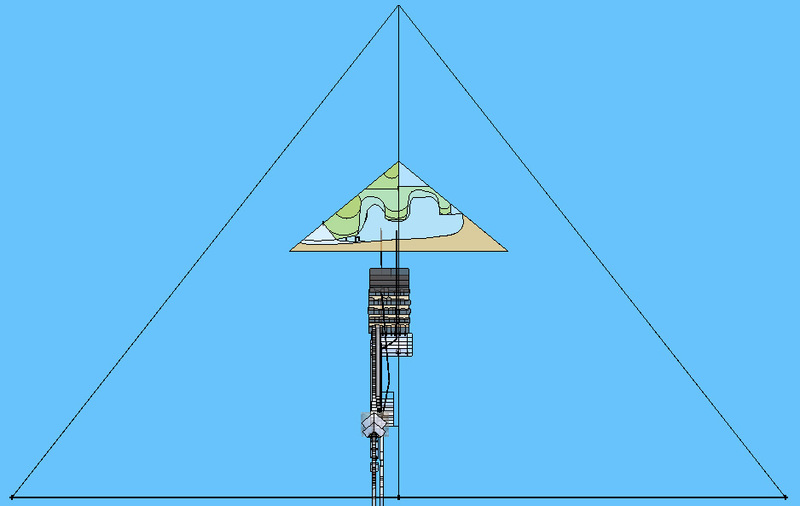 In all images thus far, we have become used to the dividing line of our horizon being placed upon the pyramid model, indicating the separation between what is above and what is below, and for the most part, there has been much agreement as to where the plan of the pyramid stemmed from: a significant era of astronomical singularities during a period of some 413 years, with one further singularity some 12,500 years later. During this analysis, we have become used to the shape and position of the equatorial line, which also provides a separation between what is above and what is below but in a whole different way. We saw how the constellation Leo bounded the ecliptic and the equatorial lines, with Regulus on the ecliptic and Zosma on the equatorial, and it can be acknowledged that it perfectly did this in 12,124 BCE. What this means is that for a great period of time, Leo was below the equatorial line, in what can be classified as the southern hemisphere, and during a long period of time it slowly but surely edged its way above the equatorial line, into the northern hemisphere. 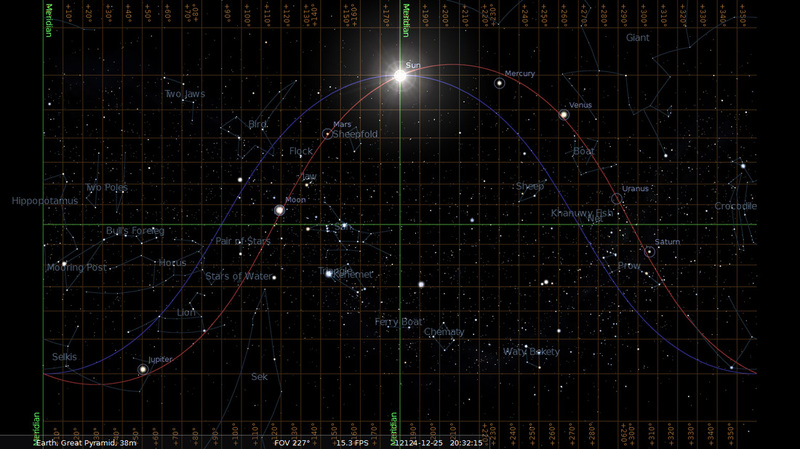 According to Stellarium, Regulus reached the equatorial line in 8,883 BCE, and on June 4th, an equinox date, the view of Leo upon the horizon just as the Sun began to rise looked like the following image. What can be seen is the equatorial line passing exactly upon Regulus while the ecliptic still holds the position it has always held in regards to the stars, which of course it would because it does so in order to observe precession. 158 years earlier, in 8,725 BCE, the equatorial line intersected with the ecliptic upon the foreleg of Leo, and during the autumn equinox with the Sun rising at dawn, the scene appeared as the next image, with Leo resting exactly upon the horizon. In describing the entrance glyph, it was said that there was a rectangular form upon the foreleg of the glyph, between the head mound and the pyramid form on the left; in front of this form, a few inches further towards the pyramid, is an upright form much like a column. A possibility of what is being presented concerns the ecliptic and equatorial lines intersected upon the horizon at dawn on the autumn equinox, being represented by the column; and the equatorial line passing through Regulus being represented by the rectangular form, or door, and considering the position of the Sun beneath Leo at a particular time, the doorway is open to receive a possibly auspicious moment. The following image is a different view of the entrance glyph, which is over a hundred years old, and in good enough shape for the statement above. The arrow is pointing to the right side of the 'doorway' and it is deemed to be open because of the hollow within it which seems somewhat round more-so than squarish. It sits more-so beneath the head mound rather than bordering it, while the column-feature sits very much beneath the middle of the sloping section between head mound and pyramid form, the shadow of which can be seen to the left of the 'doorway'. It may be a stretch of the imagination to align the image of the Sun beneath Leo in 8,883 BCE as being depicted by the rectangular form above, indicating the intersection of ecliptic, equator and horizon lines, as the better intersection is certainly when Leo is resting upon the horizon, so the intersection is exactly when the ecliptic meets the equator upon the leg of Leo. The reason for placing so much importance upon the glyph and speculating upon the possible meanings to do with its features amounts to a potential secret hiding within the pyramid, which is hinted at when several observations are incorporated together. 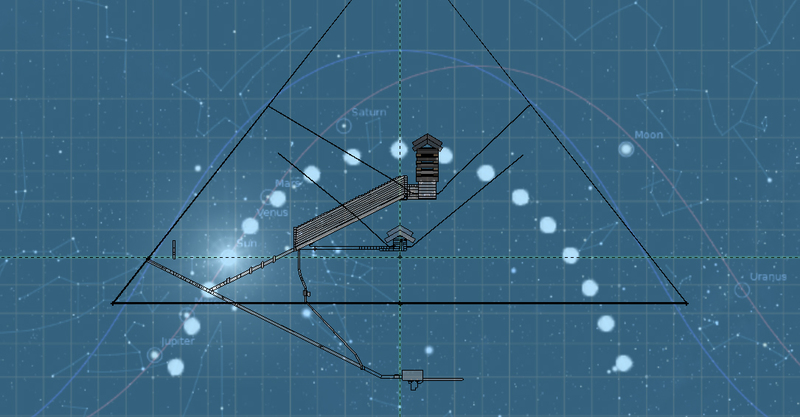 This analysis has offered direct observations to do with the actual architecture of the pyramid and the astronomical observations as provided by a software program, and it would be very difficult to sweep the entirety aside as being wrong. Obviously there might be slight adjustments to be made if any other astronomical software were used, but so many correlations have occurred when considering course levels agreeing with latitudes; and Sirius at its highest position agreeing with the half-height of the pyramid and also with the form of the Queen Chamber and its niche; and the Sun in its various positions when the winter solstice or the equinoxes are located upon the architecture. Several other specifics within the analysis are just too coincidental as to sweep aside what has been presented thus far, and while much more can be identified and speculated upon, this is the last thing this analysis will address: a hidden chamber. 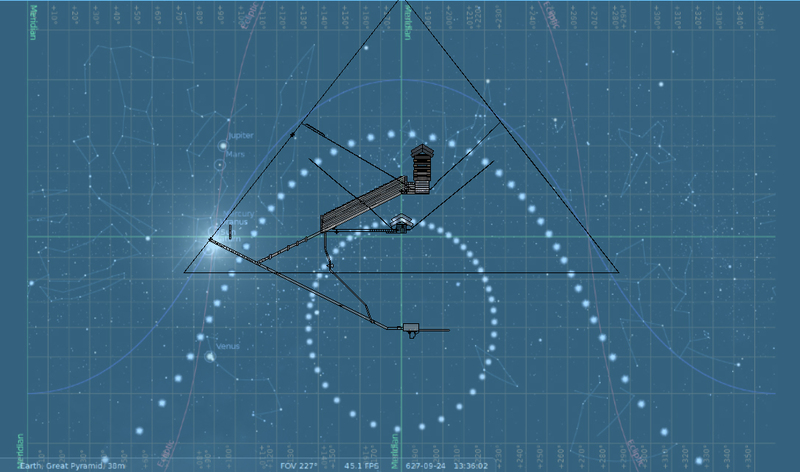 It was shown that two alignments intersected upon the greater boundary, where one of the alignments emanated from an equinox point upon the horizon – or the triple intersection point of horizon, ecliptic and equatorial lines – while the other alignment emanated from the north circumpolar level placed upon the southern meridian within the pyramid. 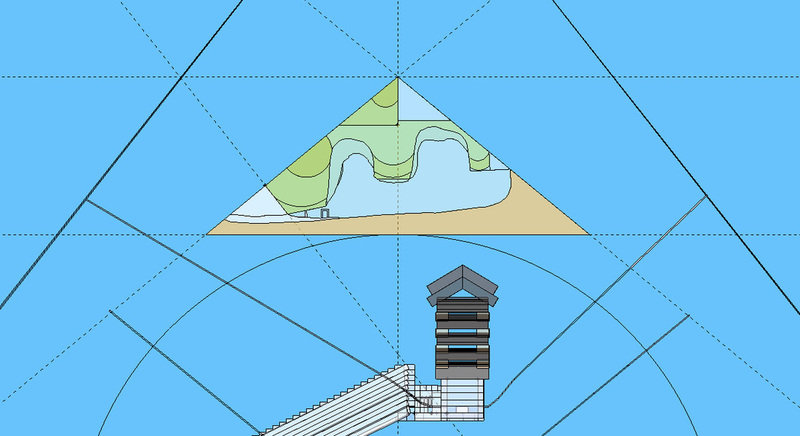 The first alignment matched the angle of the gabled roof blocks above the entrance glyph, while the second alignment matched the slope of the casing of the pyramid. I had felt that there was some further meaning to this that might allude to an interaction with the glyph, and knowing that it would only take a little time to play around with moving things here and there within the modelling program, I set about making a copy of the glyph-image I had, enlarged it, and attempted to align it in regards to the alignments mentioned above. 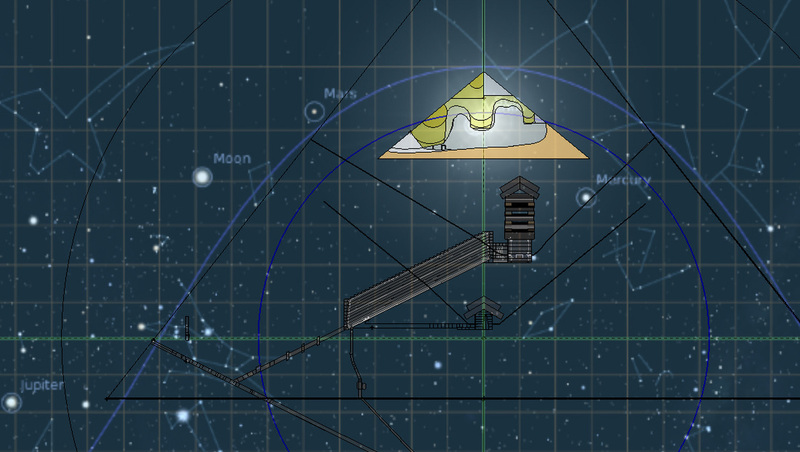 The following image shows this enlarged entrance glyph and its exacting alignments according to the pyramid angle from the NCP, the angle of the gabled roof blocks above the entrance glyph having come from the triple intersections, and the base of enlarged glyph upon the half-height level of the pyramid which is the level that Sirius reaches in 627 CE. The angle of the pyramid projected from the NCP in the pyramid is seen to overlay perfectly with the pyramid-form of the enlarged glyph, and the angle of the gabled roof blocks projected from the TI of course perfectly aligns with the enlarged glyph. Certainly this is pure speculation, and for the most part all I could do at the time was wonder about it, but in having an astronomical overlay upon the model while the glyph was imaged as such, the location of the 50º line offered up a curious correlation. From this I used Stellarium to define an image of the Sun at the height according to the slope of the pyramid, and upon the meridian: 51º 51' 14.4”. The following image shows this, using the date of January 16, 12,275 BCE, as this is one of the dates when the Sun is at this height, the other being June 9. The Sun is located upon the meridian, but it can be seen that its position reflects both curves between the mounds: the upper curve as being the level of the Sun; the lower curve being the outside edge of the Sun. The focus is on the Sun rather than the background stars, and it is possible that other years might offer up some better correlations to star positions than this one, especially considering 627 CE, but it is interesting that while the Sun is exactly upon the meridian, that a slight adjustment to have it sitting exactly in the valley between the mounds would have Pleiades as one corner of the glyph overlay. Placing an overlay depicting the Sun in the same position on February 25, 627 CE does push the boundary of believability as to the possibility of this being pure coincidence, as seen in the next image. 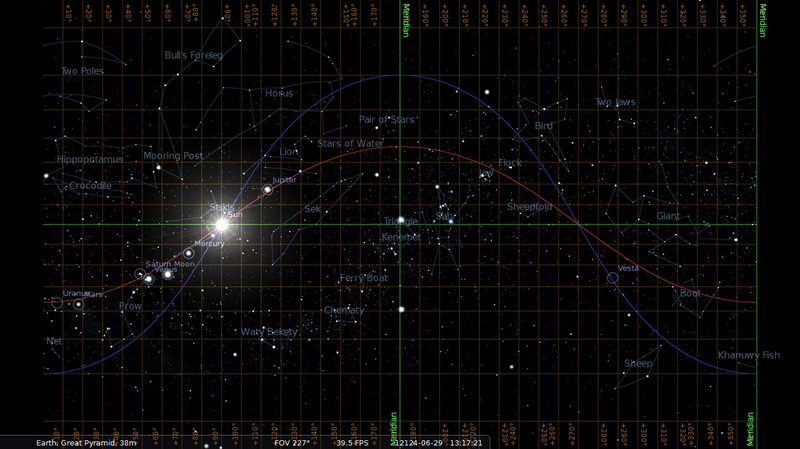 The solstice boundaries are also shown, with the winter solstice highlighted in blue. The layout of the star field suggests a nice correlation, especially considering the arrangement of the belt stars of Orion being some 117” in front of the entrance glyph, and the orientation they have as they rest upon the horizon. The area in front of the glyph holds remnants of blocks that have been removed, and Petrie identifies that there were another four layers of blocks much like the ones over the glyph, and certainly the third layer would have been in the location of where these belt stars appear. As there are only remnants now, there is no way that any estimation of what may have been in existence can be grasped, and so it is impossible to even imagine if any other kinds of glyphs existed, or if the blocks were solid and placed just to hide the glyph. Knowing the base of this hypothetical offering rests upon the half-height of the pyramid and the best height of Sirius, we also know that the best height of the Sun on a winter solstice is just two courses higher, in the 97th course, being a thinner course at the top of a small section of eight courses. It was speculated that the 98th to the 143rd course was a section associated in some way with the whole lower section of the pyramid from the 2nd to the 89th courses, and taking a measurement to the apex of the enlarged glyph has it at some 3942.5” above the pavement level, or 3213.1” above the horizon level, in the 135th course. We are aware of the form of the glyph and the discs that exist not just between the mounds but also in front and behind them. 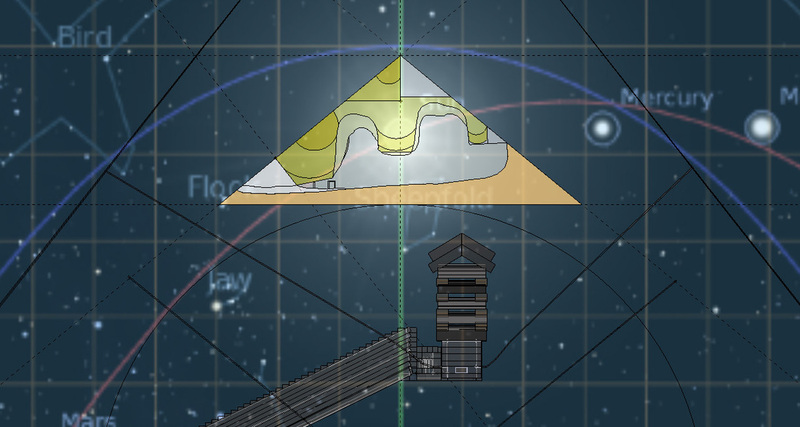 For the location of the Sun being shown, there is a very good correlation to the disc between the mounds, and this overlay upon the pyramid does suggest the potential for the glyph being a representation of what does exist within the pyramid. In saying this, then the discs in front and behind the mounds can also offer up locations of the Sun which would show a two week span of time being observed for the Sun to appear correctly. 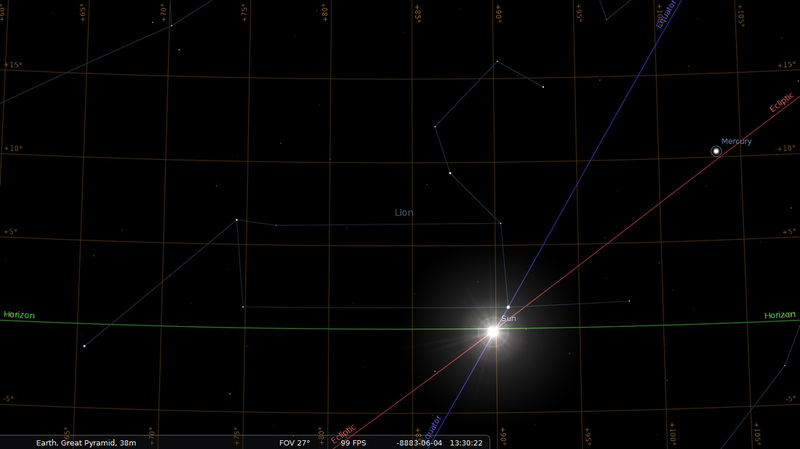 But there is also Sirius that might be a consideration according to this arrangement. In relocating the horizon for the 3,411 BCE date – when Sirius is upon the meridian and Canopus is upon the horizon – the following overlay is observed. 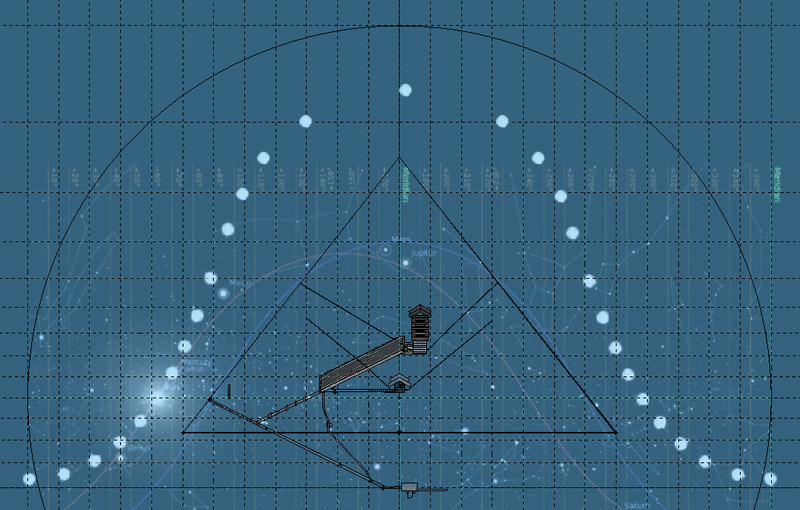 The horizon of the overlay is now upon 46th course and Sirius is upon the base that joins the two mounds, while Canopus is within the gallery and upon the angled groove that lines both sides of the walls, and Rigil Kent is within the entrance passage, just above the base of the pyramid. Then there is the relocation of the horizon for the 627 CE overlay, in the following image. One further question about this offering is in which direction should it pertain? Certainly it works having the layout thus, but considering the orientation of the glyph actually at the entrance, the same rotation might be applicable. In the way it is above, possibly there is importance with the pyramid-form being located in the north of the pyramid itself, or quite possible having the form in the east, west or south is as likely. As this is just speculation, I would like to think that the orientation of the glyph does impact upon the orientation of a supposed hidden area within the actual pyramid, and that the viewing aspect is from the north looking south, so the tracking of the Sun is normal across the sky and its represented height within the pyramid passes through this location. 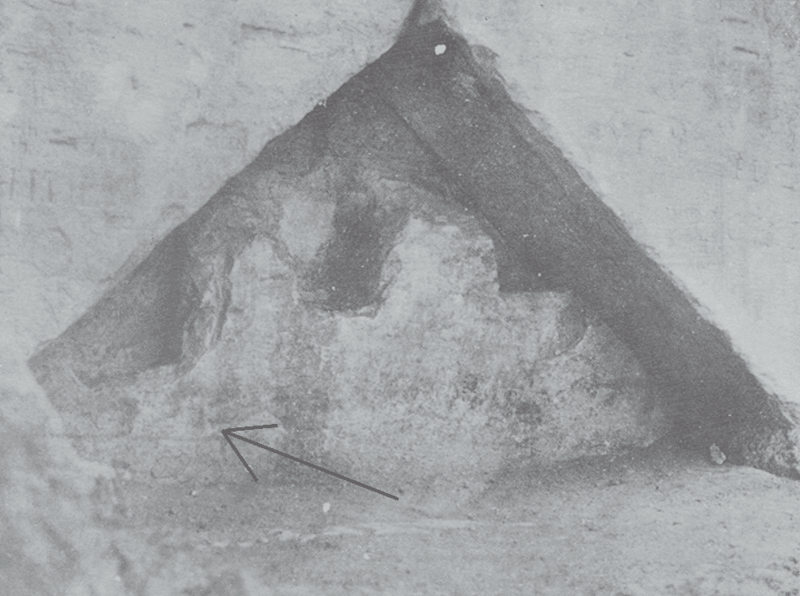 As such, and without an astral overlay accompanying, the next image suggests a hidden area within the pyramid, with the actual pyramid-form of the entrance glyph depicting a hidden chamber. The view is from the north looking south. To identify the location of the pyramid form within the actual pyramid would have its centre approximately 911” east of the central axis of the pyramid, and approximately 3,115” above the pavement level. While the centre is an approximation, it is an interesting height above the pavement level when another measurement is taken into consideration: from the CP below the Queen Chamber out to the closest casing location has a boundary of 3,118.8”. 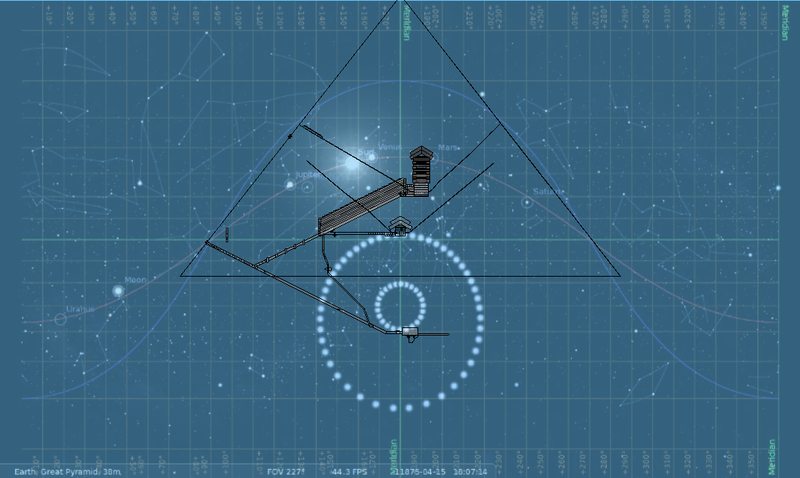 It is difficult to ignore such coincidences as this, and while this hidden area is pure speculation, it does arise from particular correlations existing within the pyramid, and also the location of the Sun when the pyramid-angle is used, and the location of Sirius when an alternative horizon level is used. One effect that has been speculated upon in consideration of the size of the pyramid is if it relates to Earth itself, in its measurements as being a scale of Earth's measurements. The last section of analysis concerns the possibility of this.